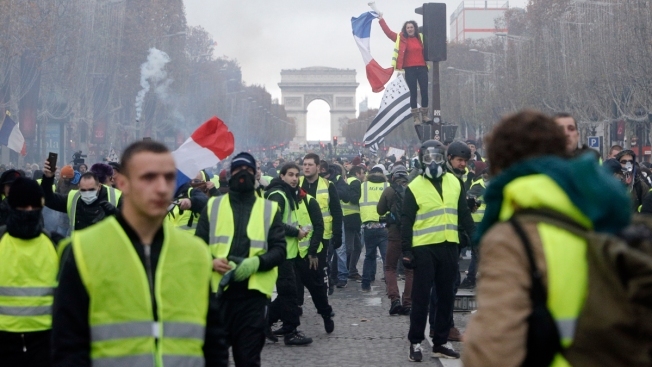 In this Nov. 24, 2018, file photo, demonstrators march on the famed Champs-Elysees avenue in Paris, France, as they protest the rising of the fuel prices. 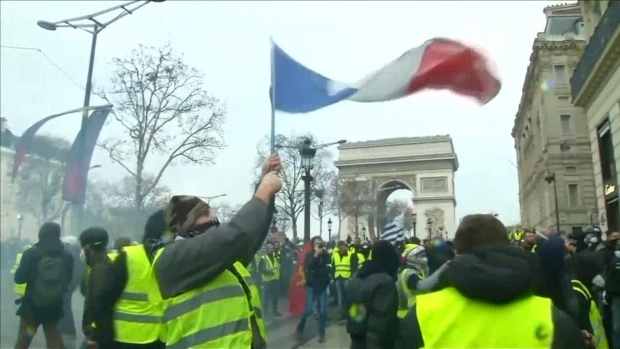 “Yellow vest” protests have gripped France for four weeks, blocking highways from Provence to Normandy and erupting in rioting in Paris. They’ve shaken the country to its core and left President Emmanuel Macron struggling to retain control. French President Emmanuel Macron is trying to take back control of his nation after a month of protests that caused mayhem across the country — and now a new extremist attack that's putting France on renewed terror alert. Striving to show he's responding to "yellow vest" protesters' demands for tax relief, the French leader maintained his planned agenda Wednesday: He held his weekly Cabinet meeting and talks with big public and private companies, notably to encourage them to give a tax-free, year-end bonus to their employees. At the same time, Macron's office said he was staying constantly informed about the investigation into Tuesday's Strasbourg attack and hunt for the gunman, still on the run. Macron said "the terrorist threat is still at the core of our nation's life," in comments reported by government spokesman Benjamin Griveaux. "Public order must prevail in every place and every circumstance," Macron added. Within his presidential palace and the halls of government, concerns about the protests remain intense despite the Strasbourg scare. The attack Tuesday night came just 24 hours after Macron broke a long silence on the mushrooming protest movement and appealed in an unusual televised address to the nation for calm. He announced tax relief for retirees and boost purchasing power of workers. An estimated 23 million viewers watched him live — more than the audience for France's victory in soccer's World Cup final in July, and a historic record for a televised address by a president. The president's office noted the viewership as a positive signal: proof that the French still listen to Macron, despite persistent calls from protesters for his resignation. Yet public opinion appeared split over whether he succeeded or not. Some members of the Yellow Vest movement have already called for new protests on Saturday, arguing the government's measures were not sufficient. Others have called for a "truce," acknowledging that progress has been made. Griveaux told reporters that it's not the government's role to call for the end of the protests. He said the government is now offering conditions for a "dialogue that doesn't take place in the street." Three online polls made after Macron's speech by Odoxa, Opinionway and Elabe institutes show that a majority of respondents still shows sympathy for the Yellow Vest movement, but the support appears to be receding compared to previous weeks. The protests have weakened Macron's credibility — which also matters on the European stage. He's maintaining his plans to go Thursday to Brussels for a key European summit that will focus on the Brexit process, but his stature within the EU is somewhat diminished. Macron's promises to protesters could cut into French growth and hurt his efforts to stick to EU deficit limits. Meanwhile, his government is about to face a no-confidence vote at the lower house of parliament. The vote prompted by far-left and Socialist lawmakers is not expected to succeed, as Macron's party and allies have a strong majority at the National Assembly. The vote, initially scheduled Thursday, may be postponed as a consequence of the shooting in Strasbourg that killed three, left a fourth person brain dead and wounded several others.